On June 21, Karnataka became the fourth state to waive off farm loans in a span of less than three months. In doing that, it joined Uttar Pradesh, Maharashtra and Punjab. Ever since the Bharatiya Janata Party government waived off Rs 36,500 crore farm loan in Uttar Pradesh, keeping a promise it made before the Assembly elections held earlier this year, farmers across the country have demanded similar treatment. With Madhya Pradesh, Gujarat and Rajasthan scheduled for polls in 2017-18, the demand will only gain steam. The Uttar Pradesh government’s decision on April 4 triggered a chain reaction. On June 11, the Devendra Fadnavis government in Maharashtra announced a waiver of Rs 35,500 crore loan to benefit 3.4 million small and marginal farmers. The total outstanding agricultural loan in the state was around Rs 62,776.8 crore. Punjab, where the Congress had promised waiver before polls, followed and announced a loan waiver of Rs 10,000 crore on June 19. Karnataka, with a loan waiver of Rs 8,165 crore, was the last one to make the announcement till the magazine went to print. The total debt in Punjab and Karnataka is estimated to be Rs 70,000 crore and Rs 52,000 crore respectively. In Madhya Pradesh, where the situation is particularly volatile and six protesters have died in police firing on June 6, the government is silent on the Rs 52,104-crore outstanding loan. Among the states that have seen protests and are likely to waive off loans, Andhra Pradesh has already started raising money through taxation. Three years ago, the newly formed Telugu Desam Party government in Andhra Pradesh had waived off Rs 24,000-crore farm loan. The Tamil Nadu farmers also undertook a month-long protest in Delhi this April to get their Rs 5,780-crore loan waived off. The farm loan waiver demand is not new, but what is different this time is the lack of support from farmer organisations. The Union government has refused to fund a nationwide loan waiver and said that it is up to the state governments to decide on the matter. Responding to a query in the Rajya Sabha last year, Parshottam Rupala, Minister of State for Agriculture, said that the total farm loan in the country is Rs 12.6 lakh crore. The figure included all outstanding agrarian loans till September 30, 2016. As per a 2012-13 survey by National Sample Survey Office (NSSO), every agrarian household is under a debt of Rs 47,000 while its average annual income is Rs 74,676. As such, state governments and political parties are under pressure to announce relief packages. The impact of this staggering outstanding loan on farmers manifests itself in various forms in the rural economy, the most visible one being farmer suicide. The latest National Crime Records Bureau data on farmer suicides shows that in 2015, a total of 12,602 people in the farming sector committed suicide in the country. This comes to one suicide every hour that year. The data is also in congruence with the loan waiver demands from Maharashtra, Madhya Pradesh, Uttar Pradesh and Tamil Nadu, which account for more than 50 per cent of farmer suicides in the country. The fact that around 36 per cent of the total suicides in the agrarian sector were by agricultural labourers shows the ripple effect of mounting debt on the rural economy. There has been an increase of 35 per cent in the number of agrarian labourers between 2001 and 2011, as per Census 2011, accompanied by a decline of 6 per cent in cultivator population. The epicentre of the current agrarian protests, Madhya Pradesh, saw one of the highest increases (64 per cent) in the number of agrarian labourers in the country. The state also witnessed one of the highest rates of decline (10 per cent) in cultivator population. Madhya Pradesh is also the only state that saw an increase in agrarian labourer suicide. Though the number of suicides by agrarian labourers in the country dropped from 6,710 in 2014 to 4,595 in 2015, in Madhya Pradesh they rose by almost 50 per cent. The state’s agrarian debt also increased by 25 per cent between 2013 and 2015. It is not surprising that the five of the six protestors who died in the state did not own any land. “The main reason for the beleaguered condition of the agrarian sector is that the farm income has not increased over time as compared to other commodities,” says Rakesh Tikait, national convenor, Bharatiya Kisan Union. “In 1967, the government procured wheat for the first time. The rate was Rs 76 per quintal, while gold was available at Rs 200 per tola (10 grams). So a farmer could buy a tola of gold if he sold two-three quintals of wheat. Today, he needs to sell 17 quintals to buy a tola,” he explains. “Ideally, one quintal of wheat should fetch Rs 3,600. 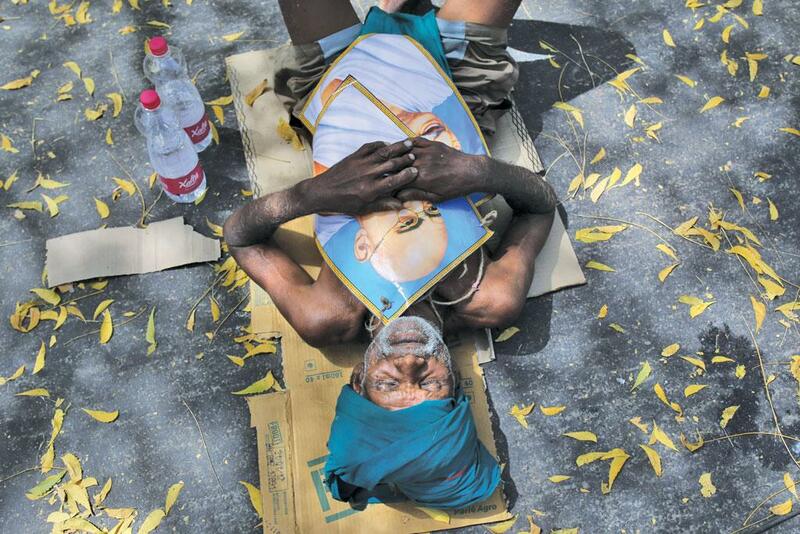 But the minimum support price of wheat is just Rs 1,600,” he laments. The problem of low farm income is not new and there are several estimates, but they differ greatly. As per a survey by the NSSO in 2012-13, the average monthly income of farmers in India is Rs 6,223, while the 2016-17 Economic Survey puts it at Rs 1,600. A 2016 report by the NITI Aayog states that around 53 per cent of farmers in India live below the poverty line, which means a monthly income of Rs 900. Though the problem of stagnant farm income is at the centre of the ongoing crisis, there are other factors at play. T N Prakash Kammaradi, chairperson, Karnataka Agriculture Price Commission, a Karnataka government body working to ensure maximum share of consumer prices for farmers, says , “A farmer should have multiple sources of income, but only one source of loan. Right now, farmers have a single source of income (crops) and multiple sources of loan (government, cooperatives and private lenders). To repay one, the farmer keeps borrowing from others, and the debt keeps piling up,” he says. Kammaradi also points out that loans are geared to encourage mechanisation of agriculture and are pushed by the industry to increase their sales.“The government’s policy is to promote mechanisation without taking into account whether the farmer has a large enough area that requires machines to cultivate. Farmers who own just two hectares are given subsidies to buy tractor. What will they do with it?” he asks. India’s first farm loan waiver was done in 1990 by the National Front government, led by the late V P Singh, which announced a Rs 10,000 crore package. The last loan waiver in the country was announced by the United Progressive Alliance government in 2008. The government also launched Agricultural Debt Waiver and Debt Relief Scheme (ADWDRS), under which farmers were to get the debt waiver and a relief package. There were questions about the efficacy in both the waivers. The 1990 waiver, critics say, only helped the well-heeled farmers because they were the ones who had access to formal banking facilities. Economists also said that farm loan waiver cannot be a permanent solution because it cripples the economy. The 2008 waiver was even worse. The scheme was meant for 36.9 million small and marginal farmers and about six million other farmers. Rs 60,416 crore and Rs 7,960 crore, respectively, were earmarked for the two categories. A review of the scheme in 2013 by the Public Accounts Committee, chaired by K V Thomas, pointed out widespread misuse of money and pilferage. According to the committee’s report, discrepancies were found in 22 per cent of the loan waiver cases. Corruption, errors in inclusion and exclusion of beneficiaries, inadequate documentation, unused funds lying with lending institutions and ineffective monitoring were the reasons why ADWDRS did not achieve its goals, said the report. The Union Ministry of Finance accepted all the recommendations of the committee and noted that more care should be taken to conceptualise and implement such schemes in future. What was considered an emergency measure has, due to faulty and mismanaged agrarian policies, become a permanent demand. “But loan waiver cannot be a practical solution,” says Tikait. “Hike the MSP, encourage cooperative industries to set up processing units to add value to agrarian produce. Most importantly, ensure a rise in farmer’s income,” he adds.